After being pulled through a black hole, four spaceships find themselves in a dimension with physics never before encountered and without fuel. By mining and collecting basic elements from the space dust and asteroids in the area, you can muster just enough thrust to move your ship. But in this bizarre dimension, gravity is not working like how you’ve been taught. Your ship will typically travel towards the nearest object… which is usually another ship… and those ships are moving. Sometimes forwards, and sometimes backwards. It’s a real mind—bender! This easy to learn game uses 26 alphabetized cards to determine movement order and thrust. Most cards move your ship towards the nearest object, but a few move you away from it. During a round, each player will play all of their fuel cards in the order of their choosing. During each phase of a round, each player will choose one card, and then they are revealed and resolved in alphabetical order. When your opponents move in ways you did not expect, you won’t always be heading in the direction you thought you would! Each player holds a “once per round only” Emergency Stop card that they may tactically play to avoid such a situation. Once will rarely be enough! Collect fuel cards by drafting them! Different elements produce varying amounts of thrust, so you can plan your moves several phases ahead. But each player is dealt two face—down fuel cards each round, so you won’t have perfect knowledge of which opponents are holding what cards. Based on the cards you are dealt, you will know what kind of cards you will need to draft. Sometimes movement order is more important than thrust strength. It all comes down to player choice and the ability to adapt to the constant changes going on all around you. Gravwell is a lightweight puzzle and race game with a paper-thin sci-fi theme. The heart of Gravwell is a combination of card drafting, variable player turns and an unusual movement mechanism that involves player’s pieces moving in relation to each other, rather than to the board. The components are solid, if not stellar, with board, cardstock and small spaceship player pieces all nicely done. The aesthetic of Gravwell is underpinned with clear and attractive graphic design, with the board and cards neatly laid out and featuring simple iconography. The art direction of the graphic design offers a colourful, nebula-like feel and the board features a couple of player aids including representation of the distribution of cards in the deck. My only negative comment on components and packaging is the empty space that is wasted in the box, whose height and width are dictated by the physical dimensions of the board but is several inches deeper than it needs to be. This, I’m sure, is down to the publishers having selected a standard box size, but results in the game having a literally lightweight, somewhat rattly feel when you pull it off the shelf. The game depth is lightweight, but deceptively so. You could set this on the table in front of your non-gamer friends, your grandmother (yes, the space theme is that thin – or undaunting, depending on your perspective) or your children and explain how to play in under five minutes. After presenting players with one example resolution of how fuel cards and movement work you will all be playing in no time. But this accessibility in terms of rule depth hides some really satisfying richness in how the game plays. The partially-hidden information of the fuel card draft, the variable turn order and the distribution of movement types and move values across the 26 cards in the deck provide a lot of interactions that create complexity for players willing to seek it out, without excluding those that aren’t. There is a healthy dose of take-that inherent in the variable turn order, some of which can be intentional but some of which will unintentionally disrupt the plans of the most avid strategist. This levels the playing field to a degree, and means that players of all abilities are in with a shout of victory. After a couple of plays Gravwell might seem too random, too luck-dependent, too chaotic. 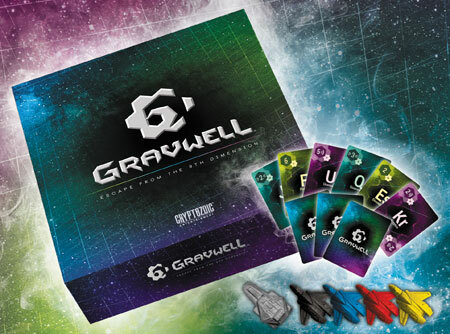 And whilst the game does become more chaotic with more players, with a higher chance of your carefully-crafted plan coming undone on the flip of the cards, Gravwell is not really about playing the mechanisms as much as it is about playing the other players. As players begin to understand this the perceived randomness or chaos is a result of players misreading each other and the board position as the partially hidden information of the fuel card draft means that each player has a good notion of what the others are holding. In each round players have to use each of their six fuel cards, three of which will have been drafted blind. This leads players in to having to determine the optimal timing for each of their cards to be played, planning as far as they are able. Coupled with the knowledge of at least some of what the other players are holding, this creates a delicious decision with each fuel card selection. Should you play that high-movement value pull card with a letter late in the alphabet in the hopes that when your card resolves the nearest piece to yours will be ahead of you? Or perhaps you should opt for a smaller move with a letter towards the start of the alphabet and get the jump on your opponents? Then you realise that each of your opponents is having the same conundrum and you begin to realise that you are second, third and fourth-guessing each other about what each of you should and will play. And there’s the flaw in Gravwell, small though it is. You will plan what fuel card to play each turn based on what your opponent should play given their situation. If all players ‘get it’, then everyone will progress around the board with the occasional surprise averted by use of the Emergency Stop card. But playing the players goes out of the window if one or more players either don’t or won’t play their hand rationally. Gravwell circumvents this dilemma to a degree with a fixed limit of six rounds. The game is unlikely to go beyond 45 minutes. I have yet to have a game last beyond 25 minutes, which is perfect for a game of this depth. Gravwell asks to be played back-to-back. Tense finishes with the last card flip settling the game between all four players are common. It is easy to get to the table, and doesn’t stay too long. This is not a game for serious strategy gamers who baulk at the idea that their plan might come undone at the first card flip, hard-core sci-fi fans expecting a rich theme, or power gamers looking for a complex multi-hour brain buster. Puzzle fans, people who like playing people and everyone else should give Gravwell a look for a fun gateway game. 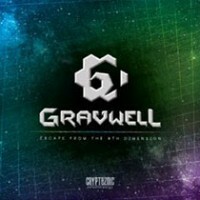 Add a Review for "Gravwell"